Initially, the treatment for M.S. was minimal. He started on a new drug that was marginally effective at best MS. is an autoimmune disease, and those who have it are affected differently. Tyler’s symptoms mainly impacted his ability to walk. While he could ambulate independently, he struggled with balance and leg coordination and fell frequently. Although it appeared Tyler was headed for a wheelchair, he was very determined to fight this dreaded disease. 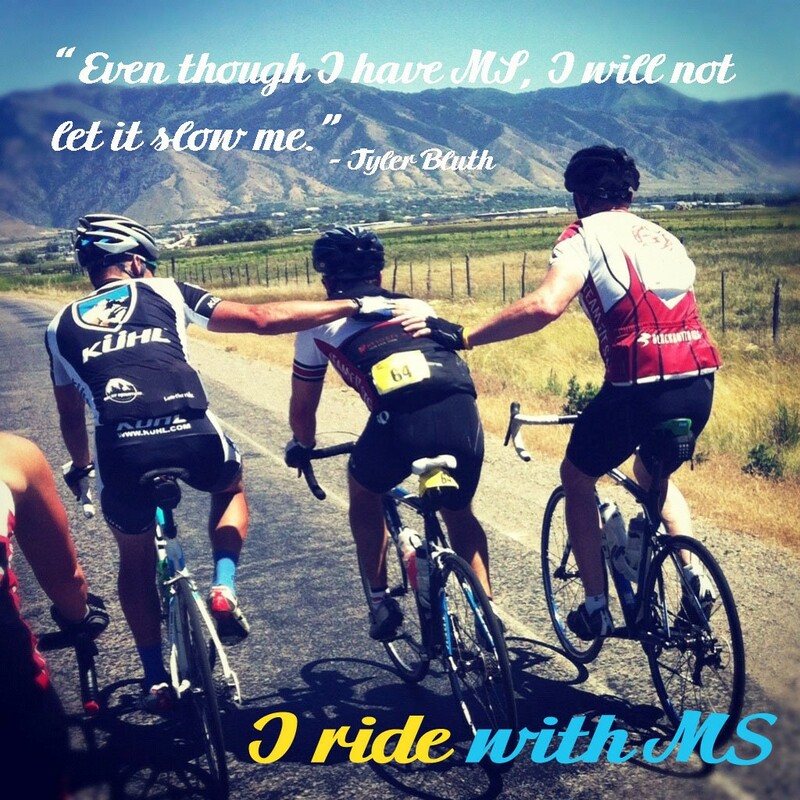 Five years ago, Tyler became more active with the Multiple Sclerosis Society and wanted to participate in the huge fund-raising bicycling event sponsored by Harmons grocery stores and other and organizations. 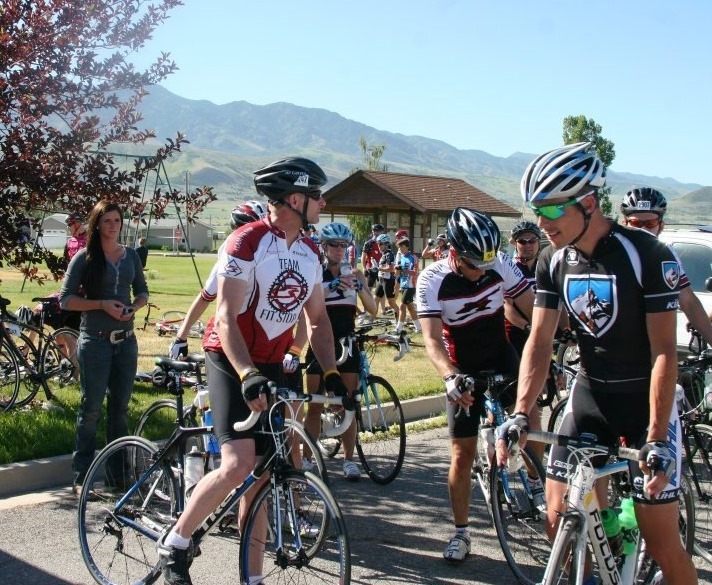 This event takes place every June in Logan, Utah that brings upwards of 3,000 bike riders together to ride and help raise money for M.S. 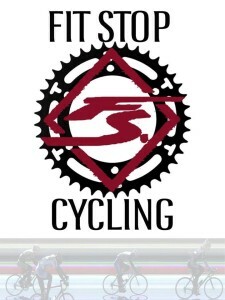 Participants can choose to ride 40,75, or 100 miles the third Saturday in June, plus a 40- or 75-mile ride on Sunday. His first Harmons M.S. ride on that Saturday was very hot. He wore a water vest in an effort to remain cool but ft didn’t work. Fifteen miles into the ride he fell off his bike at the first water stop at Trenton and couldn’t walk. His worried dad, Alan, who was riding with him, said, “Let’s just get in a sag wagon and go back to the start and chalk this up as a bad idea.” But Tyier wouldn’t quit He got back on the bike, and with a slow but steady pace and frequent stops, completed the remaining 25miles. He collapsed at the finish line but completed the ride. After that first ride, Tyler qualified for a new experimental drug administered monthly Intravenously, along with a Baclofen pump that was implanted in his abdominal wall. A catheter would deliver an anti-spasticity drug directly into his spinal column. These two drugs were effective in helping Tyler improve his gait and walk better. Tyler responded well to the new drug treatment and was able to be more active and build strength and stamina. Witnessing first-hand how research efforts were making a distinct difference in Tyler’s life and in those of other M.S. 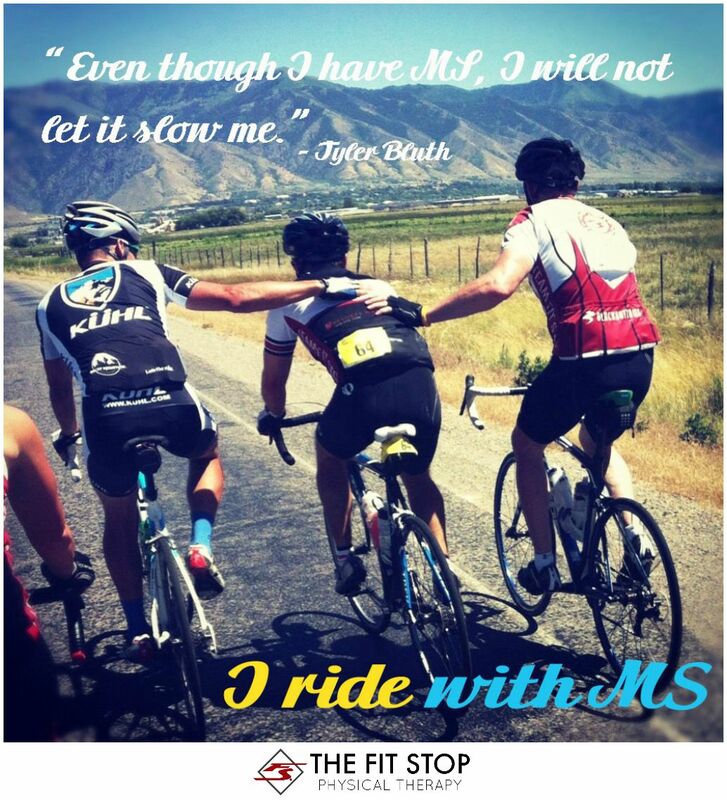 patients, we formed Team Fit Stop, a group of 30 riders that raises money for the Harmons M.S. fund raiser through email requests, dances, cupcake sales, yoga and Zumba classes, discounted juice bar smoothies, and auctions. To date we have raised more than $30,000 for the cause. The next year Tyler completed the 75-mile ride and last year the 100. Each year we have discouraged him from trying the longer distances. 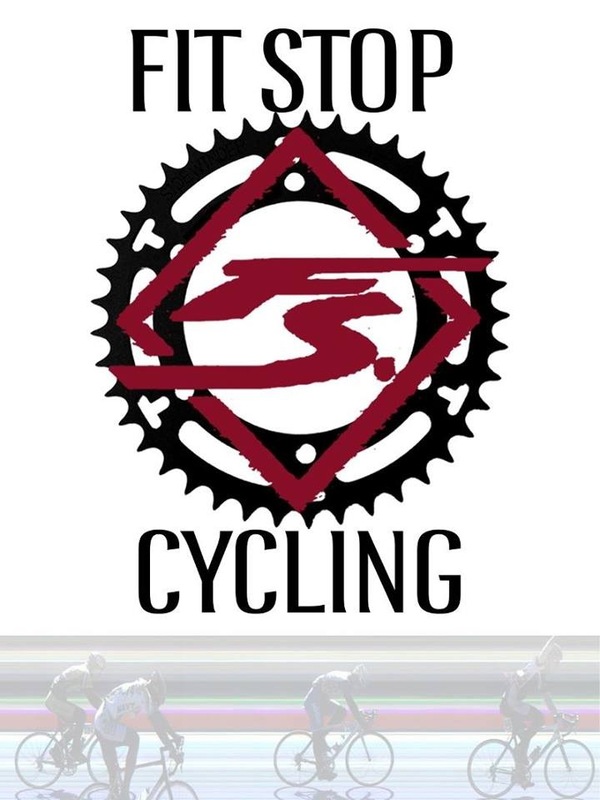 Each year Tyler organizes our team of 30 riders to train and work together. At this year’s event, the weather with challenging—extremely hot and windy. Tyler struggled. When we reached the lunch stop in Lewiston at 75 miles, Tyler couldn’t walk due to leg spasms. After recovering with fluids and a sandwich, we continued in an effort to complete the last 25 miles. Our team supported Tyler and rallied around him by forming a “human bike bubble,” protecting him from the strong head winds. The last 10 miles were remarkable. Each of the 30 riders sensed the difficulty Tyler was experiencing, and each responded spontaneously by tucking in close and bringing him home. Two riders in particular, Brian Tolbert, a world-class rider, and Bobby Salazar, a former BYU football player, rode on either side of Tyler. Brian spontaneously extended his hand to Tyler’s back from the left, and Bobby responded similarly from the right. Together they helped push Tyler along the last 10 miles to the finish. It was difficult to see the road through our tears as we experienced this incredible act of friendship extended by this group of riders, and to witness Tyler’s iron will to finish. Tyler is fine and he will ride again. That’s just how it is. Thanks so much to all who participated. This was one ride we won’t soon forget.